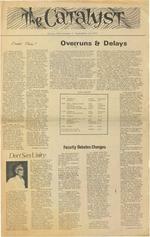 SEPTEMBER 14, 1972 The CATALYST welcomes letters from any of its readers. Unsigned letters will not be accepted. Dear Editor, It is preposterous to expect that an organization substantially in debt and on very poor terms with its suppliers could provide exceptional service to its customers. In the publishing industry, orders from bad accounts tend to get lost. Har court Brace and Jovanovich was lost. GP Putnam was lost. Holt Rinehart & Winston was sat upon A number of books had to be brought in through distributors, compounding two problems: 1) The effective operating discount of the store and 2) putting that many more people in between the ordering and the filling and shipping of the order. 1\ college expecting its students and faculty to do a substantial amount of bookreading has thus ipso facto made a commitment to see to it that those books are supplied. Such a commitment can be stated in terms of finances. New College has not made such a financial commit ment It has rather chosen to dump an, at best, marginally profitable operation onto good old American enterprise, where such enterprise is futile. The College need not make a profit on the bookstore. The College ought to have a bookstore. The College can have a bookstore. If you will call Mr. Harra every day that your book is late Chris VanDyk Dear Sir: These are days of frustation Americans want peace. They have not yet gotten it. Nor will tb.cy anytime soon America's youth often claims to be the vanguard of a new age of peace. Some have seen the truth and become frustrated Others will soon follow su.it Americans will not have peace, because they support the very institutions which make peace impossible. Consider the upcoming presidential campaign Youn citi-ing behind the honorable George McGovern. They are working "within 1b.e system" In fact, by helping to influence elections they are helping to make our republican form of government work. Which is why peace will not come soon. Thissy:ttem that so many are working in is the very cause of war. Let us suppose that Mr. McGovern is elected He will then have the power to bomb, to draft, to kill, to wage a war Anybody who wants peace would not want any to hold such power. Yet, the argument goes, Me Govern would be better than tht present incumbent and the present war. Let us even assumeand this is a dubious asswnption in of his comments about the Middle last-that McGovern would not involve this country in any other wars or military actions. What about when Me Govern is gone? Other men will rule, and we will once again be Lyndon Johnsoned into a war. What one must tm.derstand is that the President and Congress have total power. They can de as they please Those limits that we learned about in high school are farcical. The Presi dent can wage war whenever he wants. The Congress can ta> without limit. Lincoln susoon ded habeus corpus in a perfectly const1tut10nal manner The system allows the politicians to do as they please. All we can do is pray that the politicians do the i'ight things when elected Fat chance! Woodrow Wilson pledged peace Roosevelt II pledged peace l.BJ pledged peace Some day an..>ther cadidate will pledge peace, and we'll' be in trouble again. What the lover of peace and life must say -and say loud ly-is "The system is all politicians is no help, because working within the system sanctions that system. To vote for McGovern is to vote for the office of president. A president can kill or surrender at will. lovers of peace should vote "No" on president. Or government is in the bu siness of controlling individuals--at monopoly prices. So long as it exists, we will have war, we will have our money taken from us, we will be what to smoke, what job to do or not to do, and bow to position ourselves while making love. In short, we will be con trolled This control over the individual is strengthened each time we work within the government Whether we favor legalization of marijuana or not, all who campaign in the California election to legalize it are testifying that this is a proper area for government activity, that government may rightfully out law pot if it wants to. This is wrong. "But Bill," my friends tell me, "be practical. 11 They do not see that I am being practical The practical pacifist wants no man to have the legal authority to conduct war, not even George McGovern For you conservatives, practicality requires that no have the legal authority to su.rrender to the Ruskies. Is it practical to help a man to acquire power that no man ought to have? This is why I will not vote. I am far too practical As a non-voter. I am not sanctioning the acts that the govern-ment does. Even if ixon wins the election, I will say that Nixon has no right to the powers of the presidency. You voters won't be able to say that As participants in the government, you have partial responsibility for what it does. As I have no part in it, I am not responsible for its foolishness. Do not help this leviathan. Withdraw your sanction. And do it pro wily. Suppose they gave an election and nobody came? I seldom find myself in the position of recommending Socialist literature, but I just ran across an excellent article on George McGovern. Read "Everything You Always Wanted To Know About McGovern. Then decide if you want to support the Dear Sir: This morning, at one o'clock, I was attempting to attain that glorious state of relaxation known as sleep. I encountered some difficulties in this endeavor as my attention was most rudely captured by the sounds of music; I believe the term is "rock" music. played outside my room. Try as I would, I could not escape the sound and, all chance of sleep now being long past, I began to listen to this music. The first thing I noticed was that the notes produced by what seemed to be a double bass yet were weirdly dis tor ted were being transmitted with what am01.m.ted to a startling clarity. It was as if they were not broad castbythe air, as is the normal mode of sound wave transmission but by the very walls. It soon became apparent that this was actually the case. I pD'ldered upon this fact for a few brie moments, and my fatigue turned to fear as I real ized that these sounds were cap able of producing that dred natural phenomenon known as sympathetic vibrations. yes, that same awesome force of which Joshua and his uand of noble Hebrewshatnessea to topple the mighty walls of the city of Jericho; that power which can cause the best disciplined armjes to break their pace and meekly walk, rather .han boldly march across bridges forfearthat the rhythmic tread oftheirma"ch pace \'\Ould cause these horrible vibrations which could cause the bridge to col lapse and send them plummeting into tl1e abyss. As I lay in my bed, quaking in fear, I saw, in a terrible vision that incredible force shakidg the Pei dorms to their foundations and tumbling down this greatestablishmentwe call New College I call on you, the editors of the Cat:llyst, as men of influence and on all good men everywhere who care for this school to raise your voices in protest and do what you can to end this dan gerous flauntin' of nature It would be a sad eoitaph to New Collclle to sa;.r that ...it.Yas destroyed by the sound of its own voice. Respectfully, Donald Garrett Crenshaw The CATALYST (CHAIR from page one) Marcede McCambridge, tamec actress, Walt Rostow, former top l.BJ foreign policy advisor, and nutritionist Adell Davis. In addition, David Pini will conduct five film courses. The latter offerings, consisting of two classes each of the first two terms and one the third, are subject to faculty approval The pros and cons on both sides are quite strong The original idea, that of one full time teacher, was thought best for two reasons. As a semi-permanent member of the community, he/she could give more to the college than someone here little more than a weekend, if that. (Dr Reichauer will be here for a period of roughly 36 hours, at the cost of a dollar per minute (Get it while you can. ) And the effect of having a contract signed by Edward Albee, when applying to the Yale Drama School, would be quite advantageious. (Speakers cannot be sponsors, except in the case of an ISP,) On the other nann, a speakers bureau is able to present a wider area of interest (actually five areas) For, while the desire for a film teacher was representative of the student body the year Mr. Pini was one of the chair holder, there were some who did not enroll in his courses. Thus, their money was contributed to a cause which did not include them (some people might conceivably take =brage at this ) It is felt that this year, betwe between a sinologist, a nipolo gist, a diplomat, and thespian and health foods expert, thera will be something for everybody. The search for a full time student chair teacher will soon be underway. This year's confusion is the result, not of malicious intent on anyone's part, but rather no intent. According to various SEC members, the pattern was roughly this: Ms Roher Page three asks for student chair suggestions: no reply. Ms Roher looks for speakers bureau: no opposition. Ms Roher suggests speakers bureau: no opposition Ms Roher presents list of names to students: some chosen. At present Roher is a locksmith in l\ew York City This is government by default. And default is everybody's. Joseph Swift of Buildings and Grounds has indicated that he will have the common rooms of the Palmer dorms painted if requested to do so by students living in those dorms. He is as suming, of course, that if students agree to have their common rooms painted they will not deface them. FEMINIST LETTER "Don't offend any of the women--we don't want any dea 01 e Dm experfmentelfsm, couaterculture, "liberation" and radical male intellectualism the male administrative evasiveness, "liberal" tokenism denial of responsibility; all act to keep women deceived and "in their places" In f . act, m dealing w1th ISSues fundamental to women's existence at New College, we have fol.llld New College "liberalism" to be the most protean and impermeable barrier to movement. Following are some issues we have dealt with: 1) We have tried repeatedly to get a self-defense program for women but New College has not responded with anything adequate. 2). After interminable struggle, women persuaded N.C. to proVIde gynecologica_l care. A male gynecologist comes to campus about three t1mes a term to prescribe birth control pills. This is the ew College idea of adequate gynecology 3) The women have set up an abortion loan fund. 4) With great difficulty, we have gotten a room for a Women's Center for one term. 5) There is no women's dorm, but there should be. 6) For women to get money for anything(education, recreation, etc.) is almost impossible. If any money can be gotten, we have a list of Feminist speakers and contact with a women's film co-op. 7) As no Women's Studies program exists despite widespread and continued demand, the only option open to women interested in Women's Studies is to contract with a woman faculty member Half-way measures: tutorials, grour > member. Half-way measures: tutorials, group contracts. a "living-learning community" in Women's Studies. 8) All three divisions have money allotted for speakers who are habitually male. 9) The faculty and administration are almost entirely male. Hiring practices are not changing although women protest. 10) Women have tried to through ConsciousnessRaising groups (gay and straight), whid1 help women to realize that their personal problems are shared by other women. 11) There is a Women's Action Center in town (above the Florida Theatre at 5-Points), as well as some contacts with women's organilations in other parts of Florida The quiet, unobtrusive process of New College liberalism facilitates the quiet, Lmobtrusive suffocation of College women. Because of events that have occu.rred in the past year, we have found the situation for women here to be intolerable None of us will be returning in the fall, but we'll be working with women in other cities. We wish you the best, whatever you decide to do. Yours in sisterhood, NEW COLLEGE FEMINISTS 1) For a self-defense course for first term, ten weeks, $200 has been allotted to pay an instructor and costs. 1'\o female instructor is available before second term, so first-term self defense will be taught by a male. 2) New College provides a gynecologist for one hour every Monday morning and two hours every Friday, as well as an undetermined amount of time on alternate Wednesdays. This is three hours a week of gynecologic'll care on off-Wednesday weeks for approximately 300 women. 4) The Women's Center Room has been temporarily displaced, due to scrambled space arrangements. 6) An Ulldetcrmined amount of money may be available for women's activities through the Social Sciences Dept. 7) Professor Peggy Bates will sponsor tutorials in Women's Studies for those interested, but no Women's Studies Program exists now. 9) The faculty is approximately 80% male. New College women will meet to discuss tl1ese issues every Wednesday at 8:00PM in one of the H rooms. At this time, women's groups will be organized for such interests as literature, conventional and guerilla theater, art, and study seminars. /\11 student, faculty and administration women are welcome. Page four The CATALYST wi accept classified advertisements of no more than lines at the the rate of 30 per line. RESOURCES Kenna MUITay, Assistant Dean of Student Affairs, is planning a Student Resourse Guide for publication in the near future. This guide will be a catalogue of student interests and abilities, similar in concept to the Human Resource Guide. It will be organized by activity, and cross-indexed so that anyone looking for other people with similar interests can find them quickly. ceded Desperately: an apartment within three miles of campus, with minimum landlord hassles--Stan Ivester, 355-5400 or Campus Book Shop Anyone who has a kitten that he would like to give away: Please contact Tom MUITay in Social Science. For Sale: 25 lbs. dog food CHEAP See Doug Stinson Rm 146 The purpose of the guide is to remedy one of the major problems faced by anyone trying to develop the resources of the school; namely the problem of finding what resources there are. Even in An advanced Spanish course has been formed and will meet Fridays from 6:00 to 8:00 PM in H 4a. The discussions and readings will be entirelr in Spanish and cono. 'rn the reactions of Hispanic writers to the U1iited States a school this small it is impossible for anyone to know the interests of all of the students, and no existing medium adequately conveys this information. A questionnaire will soon be sent to all students, ask-ing them to list their interests, talents and other pertinent facts. A staff of students will then sort these data and produce the guide. At present Interested students should contact Dr. Dru Dougherty in Building A to pick up the rea ding for the initial class, scheduled for Sept. 22. the staff numbers only about ten and more are needed. There will be an organizational meeting shortly (possibly Monday night) which interested students are invited to attend. I NEW GYM? The Student Affairs office has discovered an empty structure owned by New College which would m::ke a "really fine" gymnasium and general athletic facility, according to new Student Affairs director Earl Helgeson. The structure covers approximately 11, 000 square feet, and has a fairly unobstructed concrete floor, which, according to Helgeson, could be covered with athletic flooring for nominal cost. The walls arc apparently reinforced concrete with a large munber of doors, which would facilitate crowd flow at large sporting events \Nhen asked how such a large structure could have been "lost, '' Helgeson replied that the building had been erected by the college for some unspecified other purpose, but that the College had run out of funds to complete the interior and had begun contemplating alteroative uses for the expensive structure. He also noted that the building could hardly have been really "lost, 11 as it was situated directly to the south and west of the Natural Sciences building where, as he put it, "it is rather hard to ignore. Helgeson went on to elaborate on possible plans for the structure, including an all-weather hockey rink and a public bowling alley. He also indicated that the area could possibly be used for some sort of classroom work and, perhaps, a few faculty offices, but that the "primary thrust" of the building's utilization would be toward activities that resulted in some "concrete return" to the school. CHECK OUR SEI.ECTIO; T OF: 3-Speed Lightweights 5-Speed Derailleurs 10 Speeds IS Normally 5 different models in stock --both men's and L.tdies' styles COMPLETE SERVICE--REPAIR SHOP THRIFTY WHEELS Within w:ilking distance-1/2 mile North of r--:'ew College on the right hand side, 7000 N. TRAIL 355-8989 'l'he CATALYST C DORM An experimental living learning community of twen ty people has been formed in lower C- a summer ISP. Recently, the community has added a stereo system to the festive atmosphere. Two private tutorials have been conceived expressly for the living-learning community. one, Group Dynamics, is taught by or. Rosel and the other, a study of the symphonies of Gustav Mahler, is taught by or. shartar. class formats are flexible with the hope of creating a bond between the students on the basis of a 11shared sensory experience." The living-learning com munity was originated by Gary Goates and Tom McGuigan during third term last year. They sent in c.oming student> information about the community along with an invitation to ,oin it. Struggling at present, the group's main task will be that of turning a few nebulous ideals into a working reality. The community extends a cordial invitation to all curious Novocollegians to look in on their experiment. polly juengling (NAT SCI from page one) ing h act been aestroyea during Hurricane Agnes in Pennsylvania, and had to be rc-I'UI1. The second cause was that the m anu:facturer had difficulty with the vinyl coating on the moveable partitions. He also stated that the air conditioning would have been turned on Tuesday, Sept. 12, and the classrooms would be ready for use on the 13th. "Assuming the furniture arrived, and this is Mr. Harra 1 s department. The remaining partitians will. be shipped Sept. 15, and are due to arrive here on Sept. 18. "Somewhere between Sept. 20 and 22, the balance of the building will be in occupancy. "The Natural Sciences Department tmderstands the situation and is not disturbed They are prepared to be cramped for a few days. However, those classroon are not ready for occupancy (sec adjacent schedule changes) The school does not have an occupancy permit, and so it was felt unwise to have classes in the buildmg. An occupancy permit requires, among other things, thirty paved par_k;.ng spaces. When asked about tl1e leg alities of the school being its own contractor, Dallas Dort stated that if the scJ100l could prove the fault lay with any individual sub-contractor, that contractor could be brought to court. However, no one but the school itself is l'csponsible for the entire building. Mr. September 14, 1972 recreation The New College recreational program for 1972-73, although run on a modest bud get, offers a wide variety of activities for NC students and needs the help of students in order to function effectively, according to Mark calkins, Assistant Dean of StudeJJt Affairs and director of the pre gram. Mark explained that there are two main groups of activities available to studentsthose by off-campus proress10na ls and those taught or directed, some on a more impromptu basis, by qualified students. Both groups are financed by the office of Stu dent Affairs budget. Activi ties in the first group include swimming, karate, modern dance, tennis, senior life sa ving, sailing, and gymnastics; those in the second group in clude (tentatively) soccer, football, volleyball, ba ketball, yoga, weightlifting, carpentry, bos:ing, ping pong, canoeing, archery, massage, meditation, folk dancing, bik touring, car rallies, fencing, and back-packing. It will take at least several weeks, according to Mark, to organ ize the entire program completely, outings and other special proJects will be announced as they arise (for example, an overnight bike trip to Myakka River State park lis being plan ned at press time for this week end). A more in-depth description of activities will be posted in Hamilton shortly--if in doubt, ask Mark. NEW POOL HOURS : 7:15 --8:00AM (morning swim) 10:30 --5:30PM 7:00 9 :00 PM Classes: ACTIVITIES SW:L\.fMING (beginning and intennediate) Mon. & Wed.: 7-9 PM KARATE (beginning and intennediate) coed; Tues. & Thurs 7-9 PM; H-1 -GYl'v1NASTlCS (beginning, etc.) Mon., Wed., & Fri.; 5:30-7 behind the last art barrack TENNIS (beginning and intermediate) Wed 12-2 room for nine students: class will divide into two hour groups next week MODERN DANCE (beginning and intennediate) coed Thurs. 12-2, Music Room; additional times to be SEN I OR LIFE SAVING begins Sept. 19, Tues. & Thurs. through Oct. 10. 6:00-9 PM. Students interested in reviewing their certificatio n should come to the Sept. 28 meeting. Work Grant students will have priority. SCUBA Offered by Pat Bird, for certification. Time o f first meeting to be announced (later this month). Cost of $25 includes all equipment. See sign-up in Hamilton. CARPENTRY look for sign designating initial meeting next week. This will be a series of instructions in using power tools and hand tools. YOGA see sign in Hamilton or contact Bonnie Simmons SAILING persons wishing to use the Stmfish this year will have to be checked out by student instructors. After you have demonstrated to one of them that you Jmow how to operate the winch and the boat, your name will be placed on a list of those approved to check out the tiller assembly from the library. (life belts and dagger-boards will be stored on the dock in a box) If you already lmow how to sail and use the winch, you still need to be checked out in that. case,. will take place quickly. See signs in Hamilton for hst of mstructors. If you wish to help instruct contact Mark Calkins. TRIPS who wish to help in organizing hiking, biking, and can con;ult Mark Calkins. He will try to schedule tr1ps focussmg on nearby wilderness areas. CANOING students, faculty, or staff who wish to use canoes individually or for a group activity please contact Mark Calkins. Hacra pointed out that contracu that contain punitive damages for late delivery, must contain bonuses for early delivery. Generally the contractor can always find someone else to pass the blame to, such as "Tlre architect changed his mind again. 11 .tvir. Harra seemed to feel it was not worth the legal difficulties. Mr. 1acDonald issued the following statement: "Any questions concerning recourse against the contractors arc 1mwarranted; the building is being completed in record time." When asked about future construction, 1\!.r. Harra stated that never has eve1yone been satisfied vith any construction on campus, but that the decisions rest with the architectur al committee. "(The Nat. Sci. building construction was) not the way I would have done it if I was the owner, because we all have our personal preferences." In general, tl1e Natural Science division feels that the ard1itcct has been unresponsivc to its needs. The final landscaping plans include a sculpture g:udcn and fountain between the two building. Dr. Steven Kirtley emphasized that ti1c building was constructed in its present location because th least number of pine trees would have to be cut down.